LendEDU released its Student Loan Debt by School by State Report which analyzes state and college level data on student debt for the Class of 2016. LendEDU is the first organization to release a detailed report using the new financial aid data. The Class of 2016 is not the most-indebted class in history, according to the second annual Student Loan Debt by School by State Report released by LendEDU. The average borrower in the Class of 2016 graduated with $27,975, down by 1.50% from $28,400 held by the average borrower in the Class of 2015. In LendEDU’s analysis, researchers found that private institutions gave borrowers an average of $30,281 in student debt at graduation, whereas public institutions gave borrowers an average of $26,828 in student debt at graduation. 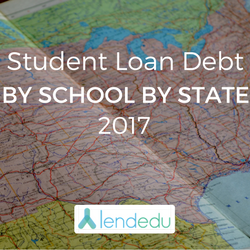 LendEDU’s Student Loan Debt by School by State Report was created using the newest Peterson’s financial aid data. Peterson’s released the new data for the Class of 2016 at the start of August 2017. LendEDU is the first organization to aggregate and analyze this data for the Class of 2016. The data was reported through a survey to the colleges and universities listed in the report. The voluntary survey received usable responses from 1,161 institutions. For reference, the data is released on a one year delay. The Class of 2017 data will not be available until the Fall of 2018. “This is the second edition of our Student Loan Debt by School by State Report. To be honest, last year we were quite surprised when our report gathered recognition from a number of elected officials, institutions, national and regional media, and families across the United States.” said LendEDU CEO/Co-Founder Nate Matherson. “We knew that we needed to do this report again for the Class of 2016. And, I can honestly say that I am surprised to see that the average student loan debt per borrower decreased this year. Moreover, I was surprised to see meaningful volatility between state rankings and average student debt balances at schools.” said Matherson. On a school level, the averages at graduation in 2016 ranged from a low of $3,809 per borrower to a high of $59,113 per borrower. To see the full-list of school level rankings, please see our full report. We analyzed all 50 states and 1,161 colleges in our full report. LendEDU licensed the data from Peterson’s for this report. For full methodology, please see the full report for a breakdown of calculations and an explanation of relevant terms. In 2014, LendEDU launched as marketplace for student loans and student loan refinancing. LendEDU helps graduates find the lowest student loan quotes with one application. Today, LendEDU helps consumers compare a number of personal finance products including student loans, personal loans, credit cards, and banking products. LendEDU works to create engaging resource content, industry leading news, and tools to create transparency for consumers. LendEDU was founded by Nate Matherson and Matt Lenhard in August of 2014. LendEDU is a graduate of Y Combinator’s W16 class, the Iowa Startup Accelerator, and the Horn Program at the University of Delaware.